You see, the average price of prom is apparently like $800… then on top of that, you have to spend the night with a bunch of obnoxious girls who spent the year comparing you to your beloved pet goldfish (who always looked a little sad) and helping themselves your raspberry lemonade Ice Breakers without asking (who knows where Lauren’s grubby paws had been??). Sure, I may have had fun that night with my friends, but I’d see them in the summer… Instead, I could save time & money and get a pair of shoes that would last me forever. My parents (who said, “if you don’t want to go to prom, it’s up to you”) ended up buying those two-tone Chanel flats for me as a high school graduation gift. In that 2008 moment, I don’t think my parents or I realised how “forever” these shoes would end up being. Despite the “I swear this is the last pair I’ll buy” empty promises, I’ve collected six pairs of Chanel ballet flats into my pseudo-adult life. Two of which have gotten too “loved” and had to be “retired” (read: thrown out). After over a decade of wearing and loving these shoes, it’s time for a comprehensive Chanel ballet flats review. Let’s start with sizing then move into why I’ve bought so many and end with, gulp, prices. Chanel ballet flats run true to French size. There is minimal sizing difference between the different materials. In all six of my Chanel ballet flats (from lambskin to suede goatskin to patent calfskin to tweed), I am a true 39. 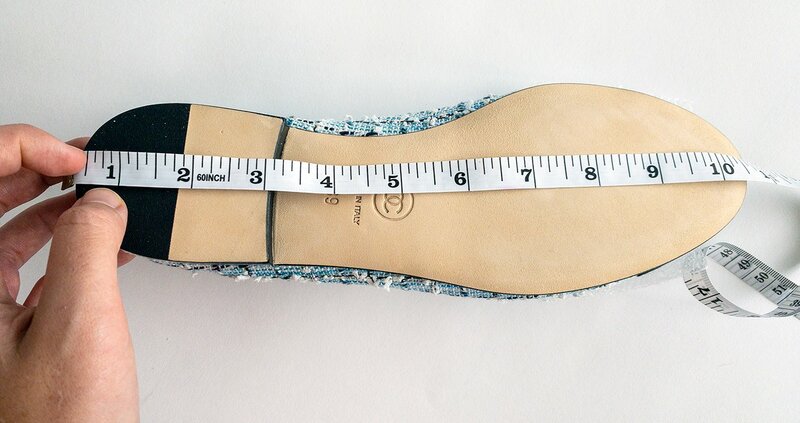 From the back of the heel to the tip of the toe, Chanel’s size 39 ballet flats measures roughly 10.5 inches (including the heel in the measurement). In comparison, my foot measures 9.25 inches from the back of my heel to the tip of my toe. The little heel measures 0.4 inches or 10 mm, which adds the smallest height… but it does add a bit more arch support versus walking in a totally flat shoe. It might take you a few wears to get really comfortable, but you shouldn’t experience anything more than a light blister on your heel and maybe your baby toe (if you’re like me). Why are Chanel ballet flats worth it? Chanel ballet flats have been popular since 1957, when Audrey Hepburn first wore them in Funny Face. It can be argued that Alexa Chung brought them back to the fashion forefront in 2008… but I’ll go a step further to argue that Vampire Weekend orchestrated that return with their eponymous debut album which centred around an ironic preppy look. … while a two-tone beige flat may have looked grandmotherly country club before, now they were cool. These shoes are almost like the entrance to a somewhat secret club where the floor is sticky and they play the music loud — your grandmother would never go to that club. Once a much higher up lady at the TV show I was working on pointed at her Chanel ballet flats and said “hey Yuki, I think we have the same shoes on…” That’s not a reason to buy these shoes, but you know that pushed all those high school nightmares out of my head and finally made me feel accepted. Ballet flats, let alone by Chanel, will never go out of style and will always be a subtly stylish choice. When you wear them you have an extra coat of armour that protects you against the mean girls. While they’re calling you names in a pair of fake Chloé boots, you’re ensconced in the safety of these classic yet stylish shoes. Material and colour combinations change with each season. But two materials come back every season: lambskin and patent calfskin. The lambskin is the softest leather you have ever felt. It feels like cutting a knife through hot butter in a cold kitchen. You could run your hands over it forever — if only you weren’t nervous about finger grease transferring. You will be terrified of scratching it, but will soon realise that it’s harder to do than you thought. I’m a clumsy walker who trips on her toes and only have a few scuffs on them. I’ve walked to & from the East Village to the Fashion Institute of Technology in Chelsea for my college classes (3.6 miles), pounded cobbled promenades in Paris (4.2 kilometres), and lazed on terrasses in Montreal (… uhh, 0 kilometres) in these shoes. In my “New York years” from 2009-2015, I quite literally (no hyperbole) wore them every single day… my Chanel ballet flats have endured a lot of wear. My Chanel ballet flats might look dodgy (read: look disgusting) on the inside after 10+ years, but when you put them on no one can tell how much you’ve worn them… I hope! These flats keep their shape and shape your legs. They have an almost magic way of pulling it all together, which lets you put your best foot forward. … actually, Coco Chanel initially made two-tone shoes so the light beige part blends into your skin tone and elongates your leg. Chanel flats are expensive, there’s no two ways about it. As of 2019 these ballet shoes run from $750 USD to the thousands (depending on material). In 2008, Chanel ballet flats cost $550 USD, now they start at $750 USD — that’s a 36.36% price increase, whoa. Sometimes Chanel ballet flats are listed on The Real Real, where you can get them for significantly less than retail. I got my most recent pair, the tweed pair, from the Chanel store in Panama City, Panamá where they cost $625 USD plus 7% tax. Depending on where you are, Chanel prices can fluctuate and it could be worth waiting if you know you can get them for less while traveling. The PurseBlog has a helpful list of the cheapest places in the world to buy luxury items. Chanel ballerina flats complement any style. If your look is preppy, they can be preppy. If your style is laid back, they can be laid back. … and if your style is 2008-Alexa Chung mixed with Kate Moss and Emmanuelle Alt (ahem, like mine), they can be 2008-Alexa Chung mixed with Kate Moss and Emmanuelle Alt, it definitely works. From 1957 to now, Chanel ballet flats are always stylish. The little bow on the toe ties any outfit together. –Classic: Name a more classic shoe, I’ll wait. –Resale Value: Historically, second-hand shoes don’t fetch for that much… but of course, since they are classic, Chanel ballet flats hold a high resale value. Depending on how well you take care of them, consignment shops & sites will list them from $345 to $745 USD. –Sizing: Some brands change their sizing now and then, Chanel’s ballerina flat sizing has been consistent for the last decade. –Structure: These flats are more structured and less floppy compared to a pair of Repettos. As a result, they pull your foot in more and slim your leg. –Price Raises: Every year, Chanel raises their prices. Sometimes the price increase includes ballerina flats, sometimes it doesn’t. Either way, get it while they’re still somewhat affordable. When you slip on a pair of Chanel ballet flats and your foot meets the floor for the first time, you can’t put a price tag on the feeling. … you can physically put a price on these flats, I guess, but that price tag somehow feels more reasonable when your foot is swathed in buttery lambskin. In that first moment, you feel how “forever” these shoes are. … well, until you run out of multiples of $750 USD. If you are still a little nervous about spending this much on a pair of shoes, drop me a line in the comments below with any questions you have. I’m always happy to talk about these shoes. Chanel ballet flats start at $750 USD and are available from your local Chanel boutique. Earlier I mentioned that Chanel ballet flats are sometimes listed on The Real Real. You can get $25 off your first purchase with my referral code, so if you find a pair that you feel confident are authentic, it could be well worth it.